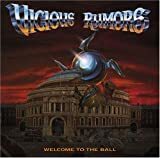 VICIOUS RUMORS YOU ONLY LIVE TWICE LYRICS"
And you don't want to make a mistake. Running blind even though they can see. losing touch with their reason to be. All a piece of the puzzle of life. Seems as though it was all meant to be. and the light at the end now is clear. Be ready to face all of your fears. All Vicious Rumors - You Only Live Twice lyrics are property and © copyright of their respective owners. All You Only Live Twice lyrics provided for educational purposes only.